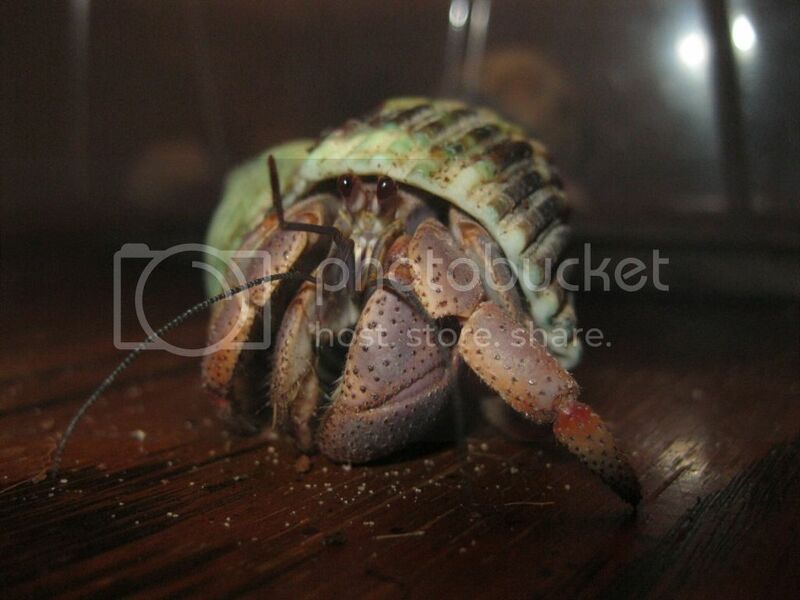 As many of you may, or may not know, hermit crabs will often shed their outer layer, or Exoskeleton. This process is called Molting. Molting is a very stressful and tiring process which your crab must go through regularly in order to grow. As Crabby is growing, his outer skin (called the "exoskeleton", or "exo") will become too small for him & so he will have to shed this skin & grow some more. When a molt is approaching, Crabby will start getting flooded with a molt hormone that triggers him to make preparations. Think of it as similar to a bear pigging out & finding a cave before hibernating. If conditions for Crabby aren't right for a molt, his body will actually delay the molt by making a second hormone that actually suppresses the molt hormone. One reason for this may be that because your crab is so vulnerable during the molting process, they need to know they have a chance of being safe during this time. When your crab is about to molt you may notice some signs. Some of these include, sluggishness (which means just being slow and/or droopy), gorging themselves with food and/or water, your crab may acquire an ashy appearance to them, or their eyes may become clouded. If your crab was missing a limb (like a leg or claw) a gel limb (a new gooey body part that starts growing to replace the lost one) may appear before their molt, or the temperament of your crab may change. All these signs could be signs of something else but quite often these things mean a molt is in the near future. However a sure sign your crab is about to molt is if you notice a sack growing on your crab, which is known as a molt sack. This is where your crab stores nutrients and water to sustain him while he is under the substrate molting and then recovering from the molt. The molt sack is located on the left side of your crab’s abdomen. The water stored (especially the salt water) is also used by your crab to help him build up pressure and literally break out of his exoskeleton. In order for Crabby to be comfortable and safe during his molt he needs a place for it to happen. This means he needs to be able to bury down deep enough that predators can't smell him when he's got his fresh new skin. This is especially important with pet land hermit crabs as this smell is also attractive to other crabs. If Crabby can't bury deep enough to get away from his tank-mates, they may eat him or simply collapse his burrow by walking above him if the sand isn't deep enough. He needs to bury down in a mix of sand & organic matter in a ratio of about 5 parts sand & 1 part organic matter. This substrate must be moist enough that the walls will stay stuck when Crabby digs a tunnel down to his 'molt cave'. Crabby still needs to be able to breathe, so you will often see a tiny hole on the surface. This is what I call a 'chimney hole', as it allows air to get down to where Crabby's buried. Some crabs create caves big enough that they don't need a chimney. Crabby also needs to be nice & moist while he's molting. This means that aside from your sand being moist (sand castle consistency), the conditions "above ground" in Crabby's enclosure must be hot & humid (think, 'tropical'). This helps conditions below be good to molt in. It must also be dark as this helps stimulate the hormones that control these stages of the molt. While Crabby is buried (a time limit that varies greatly depending on size, age & time since last molt, as well as conditions), he will begin to use that stored salt water to build up enough pressure to crack his hard outer skin. He will then essentially back out of it like a hand coming out of a sleeve or glove. Most crabs stay in their shell during this process. Crabby may then take a break for a few minutes, hours or even days. It takes awhile after the molt for your crab to regain the ability to move and begin hardening up again. During this time,they eat their old exo in order to regain some of the minerals & calcium they're using to grow the new skin. Again, the amount of time it takes for this part of the process varies from crab to crab, molt to molt. After they have eaten most or all of their old exo they will rest as their new skin is hardening up. When they are ready, they will come back up & rejoin their colony. Once your crab is finished molting & is back up and around, he will probably want to eat, drink & bathe. Adding extra calcium to the tank during this time will help him recover faster. Once he's back to trashing the tank décor, and stashing his food, you will notice that he will have little black toenails on his toes, and Crabby's legs will be extra hairy. A general rule of thumb when it comes to molts is that bigger crabs take longer to molt than smaller crabs. *It is also not unusual for a post-molt crab to surface, eat & drink & go back down for days or even weeks after a molt.